Education – No doubt, we have a group of very educated candidates. Miriam Santiago has a brilliant mind and her academic achievements attest to this. Binay, too, has an impressive scholastic record and achievement but I get the feeling that he is padding his resume (I’m suspicious of people who do nothing but go to school; I see a lot of thinkers but not doers). Mar Roxas, being accepted and finishing at the Wharton School of Business, puts him as one of the top minds in the country, if not internationally. The weakest educational credentials belong to Grace Poe, although her degree in Political Science is nothing to scoff at. 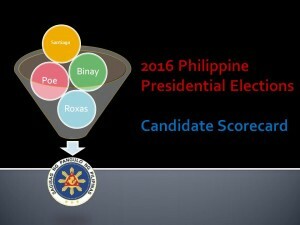 Track Record – Roxas and Santiago have a brilliant record in the Senate and in government. Two of Mar’s accomplishments are the authorship of the generic medicine law which allows the poor to purchase cheaper meds and Mar is considered to be the father of the Philippine BPO industry and the call center industry which are now two of the economic drivers of the country together with the OFW remittances. Santiago has filed the highest number of bills, and authored some of the most important laws. Some of her most important pending bills are: anti-dynasty bill; an act institutionalizing an age-appropriate curriculum to prevent the abduction, exploitation, and sexual abuse of children; anti-epal bill; freedom of information bill; and magna carta for Philippine internet freedom. Grace Poe is a relative lightweight in her accomplishments in the Senate, having been elected only in 2013. Binay has never held an elected national office although he was the mayor of Makati for several terms. He was chairman of the Housing Urban Development Coordinating Council (HUDCC) under President Aquino and Presidential Adviser for OFW Concerns but he has no achievements which stand out and are noteworthy. Competence – As far as competence is concerned, it is clear that all 4 four candidates have proven work ethic, political will, and will surely deliver. 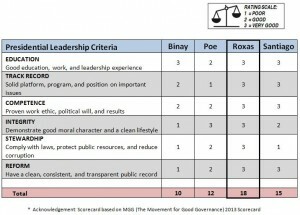 Binay gets a rating of “two” because work ethic implies integrity and he is lacking this (see next criterion). The only other ding is on Grace Poe’s track record. She hasn’t been in the political and legislative arena for a long time and, comparatively, she scores lower in this criterion. Integrity – At one time long ago, Binay was a distinguished lawyer and defender of human rights. As one of those who grew up and matured during the Martial Law days, he was a hero. But power and time change people and Binay is one of those whose integrity has taken a backseat to personal gain and nepotism. This low rating for Binay stands out because of allegations of corruption while in office (not only him but his family too). It is unbelievable that he could be this wealthy by just being a mayor or vice-president. The knock on Santiago (rating of 2) is her endorsement of Bongbong Marcos as her vice-presidential candidate. It just doesn’t add up – her past record of integrity and then teaming up with the son of a dictator who ruined the country (granted that the sins of the father are not passed on to the son, but Bongbong’s act of not acknowledging the errors of his father but whitewashing and aggrandizing the martial law reign of Ferdinand Marcos is unconscionable).